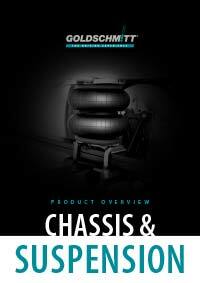 Learn about the wide world of suspension technology and contact your local Goldschmitt dealership. Goldschmitt techmobil GmbH is a manufacturer of suspensions systems, levelling systems and overheads for motorhomes, vans, ambulances, industrial and special-purpose vehicles. Our extensive product portfolio includes leaf springs, coil springs, air suspension, stabilizers, shock absorbers, spacers, aluminium rims and hydraulic jacks. If you want to increase the payload of your vehicle, using an overhead, you’re in the right place with us and our dealerships. At Goldschmitt’s own assembly centres and our certified Goldschmitt premium partners, leisure and commercial vehicles are equipped with high-quality vehicle technology. The innovative Goldschmitt products ensure better handling, better comfort and mire safety. If you have questions about our products or you would like to arrange an assembly appointment in one of our Goldschmitt Technik-Center, simply call us on +49 (0) 62 83 / 22 29-100 or send us a mail. In order to guarantee you a professional consultation in your national language, we will gladly arrange for one of our Goldschmitt representatives to advise you in your home country. In addition to a list of German and foreign Goldschmitt premium partners, we also offer you a convenient proximity search which will help you find the right Goldschmitt partner in your area quickly and easily.